Richard Francis Dennis Barry III (born March 28, 1944) is an American retired professional basketball player who played in both the American Basketball Association (ABA) and National Basketball Association (NBA). Named one of the 50 Greatest Players in history by the NBA in 1996, Barry is the only player to lead the National Collegiate Athletic Association (NCAA), ABA, and NBA in scoring for an individual season. He was known for his unorthodox but effective underhand free throw shooting technique, and at the time of his retirement in 1980 his .900 free throw percentage ranked first in NBA history. In 1987, Barry was inducted into the Naismith Memorial Basketball Hall of Fame. He is the father of former NBA players Brent Barry, Jon Barry, and Drew Barry and current professional player Canyon Barry. Barry grew up in Roselle Park, New Jersey, graduating from Roselle Park High School in 1962. Barry was an All-American basketball player for the University of Miami, where he starred for three seasons. While at Miami, Barry met his wife Pamela, the daughter of Hurricanes head coach Bruce Hale. As a senior in the 1964–65 campaign, Barry led the NCAA with a 37.4 points-per-game average. Barry and the Hurricanes did not take part in the NCAA Tournament, however, because the basketball program was on probation at the time. Barry is one of just two basketball players to have his number retired by the school. Barry was drafted by the San Francisco Warriors with the second pick of the 1965 NBA draft. In Barry's first season in the NBA with the Warriors, the team improved from 17 to 35 victories. In the All-Star Game one season later, Barry erupted for 38 points as the West team stunned the East team, which featured Wilt Chamberlain, Oscar Robertson, Bill Russell and head coach Red Auerbach among other all-time greats. Later that season, Barry and company extended the mighty Philadelphia 76ers to six highly competitive games in the NBA Finals, something that Russell and the Boston Celtics could not do in the Eastern Conference playoffs. That 76ers team is considered to be one of the greatest in basketball history. Nicknamed the "Miami Greyhound" by longtime San Francisco-area broadcaster Bill King because of his slender physical build and remarkable quickness and instincts, the 6'7" Barry won the NBA Rookie of the Year Award after averaging 25.7 points and 10.6 rebounds per game in the 1965–66 season. The following year, he won the 1967 NBA All-Star Game MVP award with a 38-point outburst and led the NBA in scoring with a 35.6 point per game average — which still ranks as the eighth- highest output in league annals. Teamed with star center Nate Thurmond in San Francisco, Barry helped take the Warriors to the 1967 NBA Finals, which they lost to the Philadelphia 76ers in six games. Including a 55-point outburst in Game 3, Barry averaged 40.8 points per game in the series, an NBA Finals record that stood for three decades. Upset that he was not paid incentive monies that he believed due from Warriors owner Franklin Mieuli, Barry jumped to the ABA's Oakland Oaks, who offered him a lucrative contract and the chance to play for Bruce Hale, his then-father-in-law. The three-year contract offer from Pat Boone, the singer and team owner, was estimated to be worth $500,000, with Barry saying "the offer Oakland made me was one I simply couldn't turn down" and that it would make him one of basketball's highest-paid players. The courts ordered Barry to sit out the 1967–68 season before he starred in the ABA, upholding the validity of the reserve clause in his contract. He preceded St. Louis Cardinals' outfielder Curt Flood, whose better-known challenge to the reserve clause went all the way to the U.S. Supreme Court, by two years as the first American major-league professional athlete to bring a court action against it. The ensuing negative publicity cast Barry in a negative light, portraying him as selfish and money-hungry. However, many NBA players at the time were looking at jumping to the ABA for more lucrative contracts. Barry would star in the ABA, twice averaging more than 30 points per game. After the 1966–67 season, Barry became one of the first NBA players to jump to the American Basketball Association when he signed with the Oakland Oaks. In the ABA's first season, the Oaks were the only ABA team located in the same market as an NBA team (the Warriors). The Warriors went to court and prevented Barry from playing for the Oaks during the 1967–68 season. Barry instead worked on Oaks radio broadcasts during the ABA's first season. During the 1968–69 season, Barry suited up for the Oaks and averaged 34 points per game. He also led the ABA in free-throw percentage for the season (a feat he repeated in the 1970–71 and 1971–72 seasons). However, on December 27, 1968, late in a game against the New York Nets, Barry and Kenny Wilburn collided and Barry tore ligaments in his knee. He tried to play again in January but only aggravated the injury and sat out the rest of the season, only appearing in 35 games as a result. Despite the injury Barry was named to the ABA All-Star team. The Oaks finished with a record of 60-18, winning the Western Division by 14 games over the second place New Orleans Buccaneers. In the 1969 ABA Playoffs the Oaks defeated the Denver Rockets in a seven-game series and then defeated New Orleans in the Western Division finals. In the finals the Oaks defeated the Indiana Pacers 4 games to 1 to win the 1969 ABA Championship. The Oaks' on-court success had not translated into solid attendance. The team averaged 2,800 fans per game. Instead of remaining in Oakland for another season to see if the championship would draw fans, the team was sold by owner Pat Boone and relocated to Washington, D.C. for the 1969–70 season. Barry played the 1969–70 season with the ABA's Washington Caps. Barry did not like the move and refused to report to the team, at one point commenting, "If I wanted to go to Washington, I'd run for president!" He missed the first 32 games before the ABA forced him to join the team. The Caps played in the Western Division, making for a grueling travel schedule. The Caps finished 44–40, claiming third place in the Western Division. Appearing in only 52 games because of a knee injury, Barry finished the season with 1,442 points, second best in the ABA (27.7 points per game). The Denver Rockets defeated the Caps, 4 games to 3, in the Western Division semifinals. As the seventh and deciding game drew to a close, Barry was ejected for fighting with Rockets players. The Washington Caps became the Virginia Squires after the 1969–70 season, but Barry was openly despondent about playing in Virginia. At the same time, he wanted to continue playing in the ABA. Featured on the August 24, 1970 cover of Sports Illustrated in a Squires jersey, he indicated that he would not return to the NBA if the league paid him "a million dollars a year." He denounced the Squires (and, subsequently, never suited up for them), saying he did not want his kids growing up with a southern accent. On September 1, 1970, the Squires traded Barry to the New York Nets for a draft pick and $200,000. The negative comments were not the primary reason; rather, Squires owner Earl Foreman was still bogged down by financial troubles and sold Barry to help meet his expenses. After the Squires dealt Barry to the New York Nets, he played in only 59 games in the 1970–71 season because of a knee injury but still made the ABA All Star team. He repeated as an ABA All Star during the 1971–72 season. During the 1970–71 season he led the league in scoring (29.4 points per game) and led the league again in 1971–72 with 31.5 points per game. In both of those years he also led the ABA in free throw percentage as he had in 1968–69. Barry also became the ABA record holder for most consecutive free throws in one game with 23. In the 1970–71 season, the Nets finished 40-44, good for fourth place in the Eastern Division and a place in the 1971 ABA Playoffs. The Virginia Squires defeated the Nets 4 games to 2 in the Eastern Division semifinals. The 1971–72 Nets finished the season at 44-40, making the 1972 ABA Playoffs by claiming third place in the Eastern Division, 24 games behind the 68-16 Kentucky Colonels. In the Eastern Division semifinals the Nets shocked the ABA by defeating the Colonels 4 games to 2. The Nets then eked out a 4-game to 3 victory over the Virginia Squires in the Eastern Division finals. The Nets were then edged by the Western Division champion Indiana Pacers, 4 games to 2, in the 1972 ABA Finals. On June 23, 1972, a United States District Court judge issued a preliminary injunction to prohibit Barry from playing for any team other than the Golden State Warriors after his contract with the Nets ended. On October 6, 1972, the Nets released Barry and he returned to the Warriors. Upon Barry's return to the Warriors and the NBA, the cumulative effects of knee problems were taking their toll. Barry gradually moved his game away from the basket, becoming more of a perimeter shooter and ball distributor. The Warriors ran one of the few offenses in basketball where a forward (Barry) was the primary ball-handler. Two seasons later (1974–75) the Warriors captured the division crown and Barry averaged 30.6 points per game, led the league in free throw percentage (.904) and steals per game (2.9), and ranked sixth in assists per game (6.2). The Warriors executed a four-game sweep of Elvin Hayes, Wes Unseld and the Washington Bullets in the NBA Finals. The Bullets had posted a league-high 60 victories, 12 more than the Warriors total in the regular season. Barry was named NBA Finals Most Valuable Player. The next season, the Warriors drafted Gus Williams to play point guard and began to utilize the talents of Phil Smith more at shooting guard. Barry's scoring average dipped to 21.0 ppg, but the Warriors finished with the NBA's best record at 59-23 and were heavy favorites to return to the NBA Finals. However, the Warriors were upset in the Western Conference finals by the Phoenix Suns. The Warriors won 46 games the next season (1976–77) with Barry, Smith, and Williams sharing scoring and ball-handling, but were ousted in the second round by the Los Angeles Lakers. Reportedly, Barry and Williams clashed over the ball-handling role, and Williams was traded after the season to the Seattle SuperSonics. Barry then averaged 23.1 ppg in his last season with the Warriors (1977-78) but the team did not make the playoffs and Barry left as a free agent for the Houston Rockets. Barry ended his career with the Houston Rockets, playing through the 1979–80 NBA season. Barry was signed by the Rockets as a free agent before the 1978–79 season. The league awarded John Lucas to the Warriors as compensation. Now in the twilight of his career, he pioneered the "point forward" position as a ball distributor (passing for a career-high 502 assists) and three-point threat. Until the arrival of Larry Bird, Barry, John Havlicek, and Billy Cunningham were the only players in NBA history to pass for more than 500 assists while primarily playing the forward position. He averaged 13.5 points and set a new NBA record (since broken) with a .947 free throw percentage for the season. He retired in 1980. During the 1990s, he coached the Cedar Rapids Sharpshooters of the Global Basketball Association and the Continental Basketball Association, guiding the Fort Wayne Fury to a 19-37 win-loss record in 1993–94. In 1998 and 1999, he served as head coach of the New Jersey ShoreCats of the United States Basketball League. Former Warriors teammate Clifford Ray was his top assistant. Barry finished 2nd in his division at the 2005 World Long Drive Championship. Barry is part owner and promoter for the Ektio basketball shoe, which doctor and former college basketball player Barry Katz designed to reduce ankle injuries. He also serves on the company's Board of Directors. Barry was among the first professional basketball players to make a successful transition to the broadcasting profession. He began broadcasting during the 1967–68 season broadcasting Oakland Oaks games because of contractual matters that kept him off of the court. Barry continues to work in the field, a career that began with his own radio show in San Francisco and CBS while still an active player and then with TBS. While working as a CBS analyst during Game 5 of the 1981 NBA Finals, Barry made a controversial comment when CBS displayed an old photo of colleague Bill Russell, who is African-American, and Barry joked that "it looks like some fool over there with that big watermelon grin". Barry later apologized for the comment, claiming that he did not realize that a reference to watermelons would have racial overtones. Russell said that he believed Barry with regard to Barry's racial attitudes, but nonetheless, the two men are reported not to have been particularly friendly for other reasons, unrelated to that comment. CBS did not renew Barry's employment for the subsequent season, with producers later citing the overall negative tone of Barry's game commentary. The next season, Barry did some broadcasting for the Seattle SuperSonics, however a plan for permanent employment fell through when Barry insisted that his then-wife be allowed to join him when the team was on the road, which would have been contrary to team policy. The next year, Barry was featured in a lengthy Sports Illustrated article written by Tony Kornheiser in which he lamented the failure of his broadcasting career to that point, as well as the fact that he'd left a reputation within NBA circles for being an unlikable person. After this, Barry worked with TBS and later on, TNT into the 1989–90 season, mostly as a color analyst but sometimes as a play-by-play announcer paired with Bill Russell. One of the more notable games Barry called as play-by-play announcer on TBS was Game 5 of the 1985 Eastern Conference Finals between the Boston Celtics and the Philadelphia 76ers, where Larry Bird made a last second steal that sealed the win and the Eastern Conference Championship for the Celtics. After the 1989–90 season, Barry became the color analyst for the Atlanta Hawks' games that aired on TBS, paired with Skip Caray. In a rare non-sports venture, he hosted the pilot for the mid-1980s game show Catchphrase; however, when the series debuted in the fall of 1985, game show veteran Art James replaced him (the series itself was short-lived in the US, but was brought over to the UK and is still running). In September 2001, Barry began hosting a sports talk show on KNBR-AM in San Francisco until June 2003, when KNBR paired him up with Rod Brooks to co-host a show named Rick and Rod. The show aired on KNBR until August 2006, when Barry left the station abruptly for reasons not disclosed to the public. Barry is of Irish, English, French, and Lithuanian descent. He was a member of the Kappa Sigma fraternity. He has four sons and a daughter with his first wife Pam: Scooter, Jon, Brent, Drew and Shannon. All of Barry's sons were professional basketball players. Barry wrote an autobiography, Confessions of a Basketball Gypsy: The Rick Barry Story with Bill Libby that was published in 1972. He also has a son, Canyon, with his third wife, Lynn Barry, who is a professional player, playing for Chinese club Hunan Jinjian Miye in the 2018–19 season. When his son Brent won the NBA Championship in 2005 with the San Antonio Spurs, Rick and Brent became the second father-son duo to both win NBA Championships as players, following Matt Guokas Sr. and Matt Guokas Jr.. Later, this would be repeated by Bill and Luke Walton, and Mychal and Klay Thompson. Jon and Brent have also moved to broadcasting after retirement. Jon currently serves as a game analyst on ESPN while Brent works as a studio analyst on NBA TV. Scooter won titles in the CBA and the top Belgian League. Elgin Baylor, Michael Jordan, Hakeem Olajuwon, Shaquille O'Neal, and Kevin Durant also achieved this feat. ^ "Rick Barry". NBA.com. Turner Sports Interactive, Inc. Retrieved January 26, 2016. ^ "Hall of Famers". Basketball Hall of Fame. Archived from the original on October 16, 2012. Retrieved August 2, 2009. ^ Miami Hurricanes 2011-12 media guide. Retrieved on January 5, 2012. ^ via United Press International. "Barry Accepts $500,000 Contract; He Quits N.B.A. for 3-Year Pact With Oakland Five", The New York Times, June 21, 1967. Accessed September 1, 2010. ^ via United Press International. "WARRIORS UPHELD ON OPTION CLAUSE; Court Rules Barry is Bound to Club One More Year", The New York Times, August 9, 1967. Accessed September 1, 2010. ^ Hollander, Dave (November 24, 2013). "Big Jerk, Bigger Hero". Slate. Retrieved November 26, 2013. ^ "Sit Up And Take Notice". CNN. January 18, 1982. ^ "Barry to Coach" (AP). The New York Times. October 30, 1992. ^ "RE/MAX World Championship's 2005". Morgan Studios. ^ Heitner, Darren. "Professor of Sport Agency Management at Indiana University". Forbes. Retrieved September 2, 2014. ^ Cook, Bob (June 2004). "Kick Out the Sports!". Flak Magazine. ^ Thornton, Jerry (September 21, 2005). "Sportscasters Gone Wild". Barstool Sports. Archived from the original on May 9, 2006. ^ "Telepictures' "Catch Phrase" (page 120)" (PDF). Broadcasting [date=1985-01-14. ^ "Barry leaves afternoon radio show at KNBR". San Francisco Chronicle. August 14, 2006. ^ Gordon, Amanda. "A Basketball Legend Scores for Migdal Ohr and Children of Israel". NYSun.com. Retrieved May 15, 2008. ^ Barry, Rick; Libby, Bill (January 1972). Confessions of a Basketball Gypsy: The Rick Barry Story. Prentice-Hall. ISBN 0131674455. 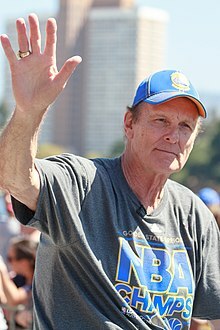 Wikimedia Commons has media related to Rick Barry.